Should You Be Using a Plastic or Metal Afro Pik? Whether it's for added volume or Diana Ross-level froth, your hair drawer needs an Afro pik. But should you be using metal or plastic? Short answer—both. Plastic piks are gentler. For fine hair, these are the clear winner. Looser curl patterns may even reach for one to distribute product, plastic piks are great at that. 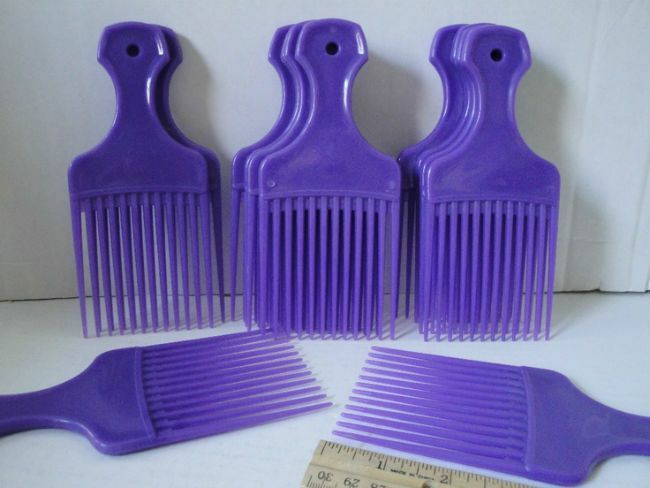 If you like to rock a completely picked out ‘fro, you should certainly use a plastic pik for this as well. Although they may be far more gentle and versatile than their metal counterparts, don’t count them out just yet. Metal piks may look like a path to certain breakage, but when used properly they are an absolute godsend, especially for thicker hair and tight curl patterns. To get more volume in your twist-out or fake a more tapered cut, simply part your hair and slide in a metal pik. After a few short strokes (into your roots only), move on to the next section. Use care and control to avoid scratching your scalp. For added protection, try dipping your Afro pik into a little coconut oil. What does your pik collection look like? Metal? Plastic? Long spikes or short? Reach for your plastic Afro pik to pick out ends, distribute product, or volumize loose curls; but 4b-4c hair types may want to leave the serious root lifting to a metal pik. Always try to get as much volume as you can with your fingers first before whipping out any comb, brush, or pik.